There were a number of popular American “woodies” built shortly after World War II. The Chrysler Town & Country is among the very best – as are Ford Sportsman Convertibles. You’ll notice many of these cars are painted in some shade of maroon or green. Something about those colors really sets off the woodwork running down the sides. This Model 79A Super Deluxe has a 100 horsepower 3.9-liter V8 and red leather interior. 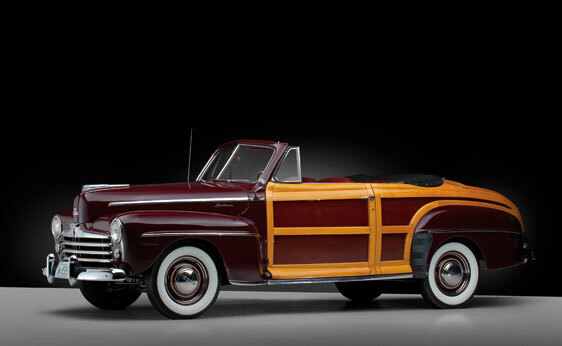 The wood-bodied Sportsman ran about $500 more than its metal equivalent and was available from either Ford or Mercury. From reading the description of the restoration, it sounds like restoring the wood took longer than the original build time of the car. This car was part of the Nick Alexander woodie collection that was auctioned off in 2009 and is being offered from the Dingman Collection this weekend. It sold for $220,000 in 2009 and is expected to bring somewhere between $240,000 and $280,000. For the complete lot description, click here and for the rest of the expansive Dingman Collection, click here. This entry was posted in Uncategorized and tagged 1947, auctions, cars, classic, classic cars, convertible, ford, rm auctions, sportsman, super deluxe by classiccarweekly. Bookmark the permalink.